Green_A2_Envelopes_-_4_38_x_5_34 is rated 4.7 out of 5 by 3. Rated 4 out of 5 by mikkihw from Lime Green envelopes I love the color , they will get noticed and hopefully opened! Rated 5 out of 5 by Spot Checker from Perfect! Very nice, of good quality. Equally as nice as "Paper Source" for far less money. I look forward to ordering more. Rated 5 out of 5 by JACWS from Gorgeous paper! The beauty and quality of these paper products exceeded my expectations! The color were clear and the paper thickness was appropriate. Thank you! The standard size for a check is our #10 envelopes. Hope this helps! 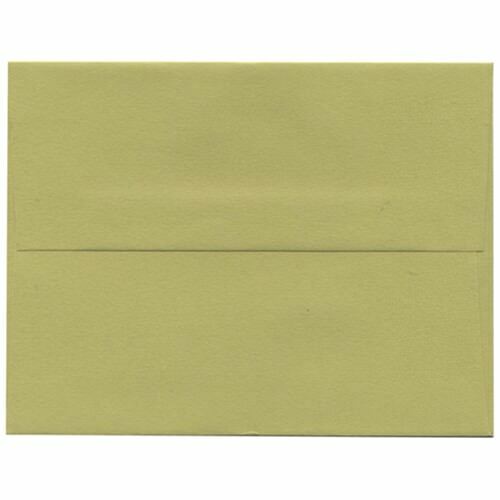 What is the weight of the paper used for these A2 envelopes in Lime green? &nbsp;thanks! The weight of the paper is 24 lb. Thanks for the question! If you were ever told to eat your greens as a child, than you know the benefits a daily serving of green can bring to your life. Make sure you serve you friends, families and clients with plenty of greens the next time you need to mail something out. Green 4 3/8 x 5 3/4 Envelopes are perfect for every day mailings such as invitations, greeting cards, announcements and simple letters. With a variety of greens to choose from, finding the perfect color has never been easier. Try our Translucent collection for a semi-see through look, unique as could be. Or try our shiny Stardream options that will surely bring a shining smile to your recipient's face. Go vibrant with Ultra Lime or go sophist acted with Dark Green. Green A2 Envelopes measure in at 4 3/8 x 5 3/4 and come in packs of 25. Does your business logo include green? Then get a bulk of 1000 for all of your business mailings! Green 4.375 x 5.75 Envelopes are the way to go for a healthy and strong look! So get those greens in today!